If you can't hit your driver, don't. In fact, don't try to hit any driver - go to a 2-wood. I see almost no players doing this, and it's a shame, because I think most amateurs would play better golf teeing off with a 2-wood than with a driver. You get virtually the same distance with a 2-wood as you do with a 1-wood. 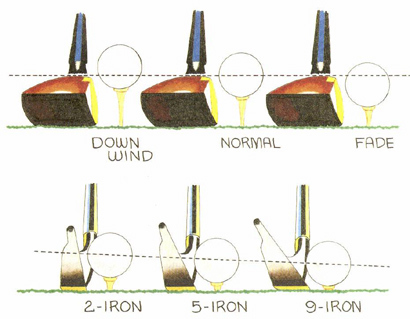 The fact is, your ball will fly farther with the 2-wood than with a driver, it just won't roll as much. Overall, the difference isn't more than ten yards, particularly on today's heavily watered courses. In addition to the added carry, you'll hit shots with greater elevation and less sidespin than with a driver. You'll also have a club with a slightly shorter shaft which makes it easier to wield and easier to hit accurately. And since you'll know you don't have the ultimate distance club in your hands, you shouldn't be tempted to swing from the heels. Knowing you have a control club should breed a controlled attitude in your swing. Finally, the 2-wood can be a valuable weapon from the fairway, especially if it's a low-profile metal wood. Give it some thought - the 2-wood is one of the game's best-kept secrets, and it could become your secret weapon.